The South Fork Garcia River Coho Habitat Enhancement Project was implemented in June 2014 through the collaborative efforts of Trout Unlimited (TU), Blencowe Watershed Management, the Mendocino Redwood Company (MRC), The Nature Conservancy, the Mendocino County Resource Conservation District, and NOAA’s Restoration Center. The South Fork (SF) Garcia River is a tributary to the Garcia River, and is located in coastal Mendocino County. The SF Garica River flows generally north along the San Andreas Fault and supports populations of both coho salmon and steelhead trout. Data collected within the last decade show low quantities of functional large woody material (LWM). Although woody material densities are very low, juvenile coho salmon and steelhead trout are consistently present during the spring and summer. 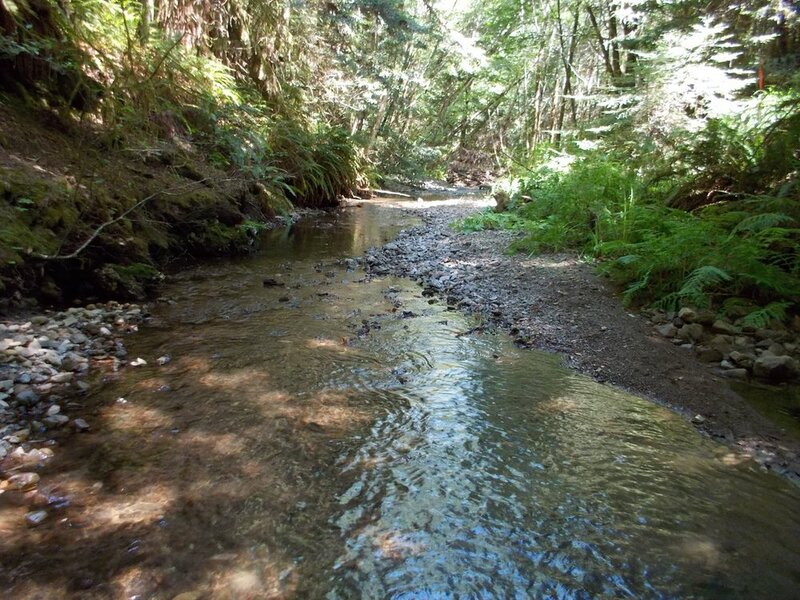 This restoration effort is part of Trout Unlimited’s North Coast Coho Project (NCCP) which intends to address factors and issues affecting coho salmon and steelhead recovery in Northern California coastal watersheds. The NCCP has a long history working in the South Fork Garcia River watershed. One of the first efforts undertaken by the NCCP was the South Fork Garcia River Watershed Restoration Project in 1998. During this effort, Trout Unlimited retained Pacific Watershed Associates (PWA), of Arcata, CA to conduct an upland sediment source assessment and develop an implementation plan for controlling erosion and sediment delivery from the entire South Fork Garcia River watershed (8.0 mi2) owned and managed by Mendocino Redwood Company. Concurrently with the PWA upslope planning process TU was identifying the locations for and types of potential instream habitat improvements. This project was guided by both the CDFW Coho Recovery Plan and the National Marine Fisheries Services (NMFS) Recovery Plan. Both plans indicate there is very good spawning habitat present in the SF Garcia River. Both documents categorize the SF Garcia River sub-basin as a high priority for coho recovery and recommend installation of LWM. MRC considers this project reach one of the highest priorities for LWM placement in the watershed. 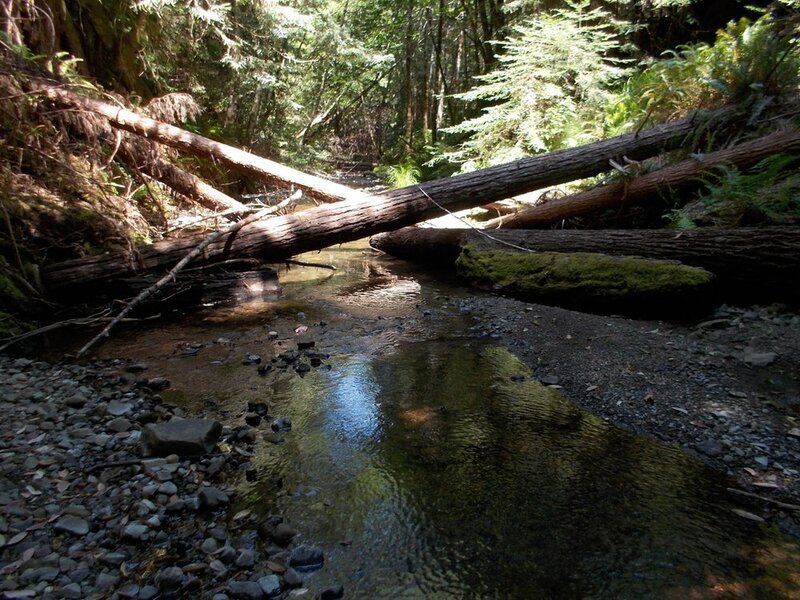 Large wood is known to create habitat complexity and enhance valuable habitat for both coho salmon and steelhead trout. The project’s goals were to improve overall habitat quality for coho salmon and steelhead trout throughout 1.5 miles of the SF Garcia River. The project utilized the proven and cost-effective accelerated recruitment method which strategically places large wood instream by directly falling live trees into the stream channel. The project’s specific objectives were to increase the length and depth of pools, improve spawning gravel retention and deposition downstream of scour areas, and provide additional pool cover for escapement from predators. Also, large wood can assist with the transportation and sorting of excess sediment. Using the accelerated recruitment method 99 pieces of large wood were added to the channel in a stream reach where vehicle and equipment access was prohibited. The channel shape and morphology of the project reach lent itself well to free falling due to a well-established flood plain and wide alluvial active channel. After the wood was placed into position the attached limbs of the free fallen trees were “stobbed” or cut off at lengths of 12”’-36” in order to increase individual log surface area and ‘roughness’. Stobbing limbs is believed to minimize whole limb breakage and increase the recruitment of small woody debris. Additionally, many limbs (SWD) were placed by hand upstream of and amongst project logs. A significant number of large Alders were added to the project (27) but were not tagged as official project piecesTypically conifer species are preferred for LWM structures because of their longevity and resistance to decay, but some coastal streams lack adequate large conifers in their riparian corridor. This can limit the ability for restoration in stream reaches where large wood is lacking. There is an increasing interest in experimenting with Alder as LWM because it is commonly abundant and may help recruit other pieces of large wood that would otherwise be transported through a stream system. This project was the first large wood project to be implemented under the authority of the Coho HELP Act. The Coho HELP Act allows persons, public agencies, and nonprofit organizations to request approval from the California Department of Fish and Wildlife (CDFW) for specific coho salmon habitat enhancement projects. The intent of the Coho HELP Act is to expedite the permitting process for voluntary habitat improvements. The Act empowers CDFW to use a one stop process for approving immediate on-the-ground habitat restoration projects proposed by governmental and non-governmental partners to aid California’s struggling coho salmon populations.